This page contains information I acquired during the design and construction of a 7.5" aperture F8 Maksutov-Cassegrain telescope. The telescope uses a 3-element design with a separate secondary mirror. This design form is often referred to as a Rumak or Sigler Maksutov. Design work began in September 1997, with the actual work on the optics beginning in December and being completed (except for final testing) in March 1998. The mechanical work was completed by October 1998. The following winter provided very little incentive to complete the scope (only final figuring remained), being one of the rainiest on record in Vancouver, B.C., so the project sat untouched for almost 8 months. In June the optics were re-aluminized and the scope saw first light. The un-figured scope performed very well, but more careful collimation and testing indicated a very slight overall oblate-spheroidal figure that significantly affected the resolution at higher magnifications. This was corrected by a total of approximately two hours figuring on the front of the corrector lens. 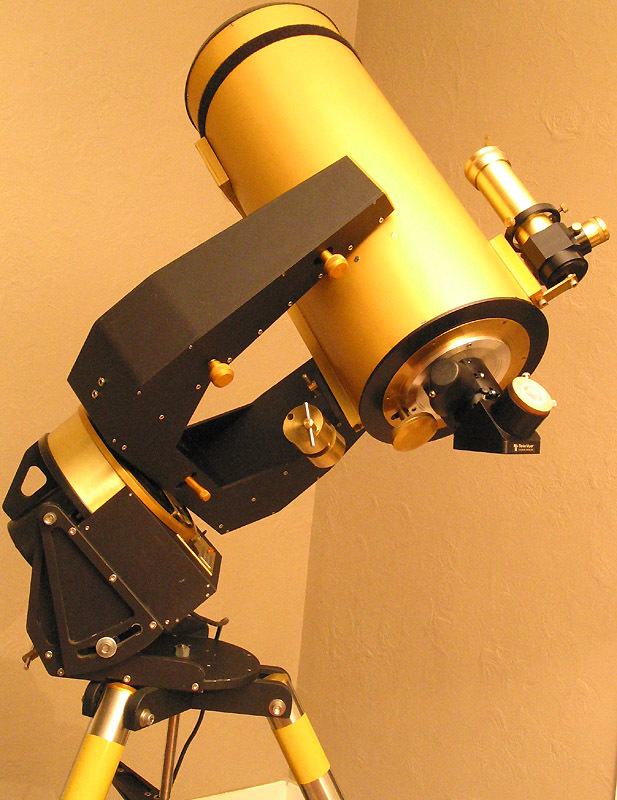 In the fall of 2003 several improvements were made to the scope; new coatings to increase the throughput, several minor fixes to allow for better collimation and the addition of a JMI motofocus assembly to eliminate problems with mirror shift. The scope made its first appearance at the Mt. Kobau star party in the BC Okanagan in July-August 2003 and was featured in Sky and Telescope's online news for August 2003 (see "Two Fine Western Star Parties"). It is worth noting that when I derived this formula for myself I found that one must assume that the height of the traced light ray above the optical axis must be much smaller than the radii R1 or R2 for this expression to be strictly valid. In other words, you shouldn't be surprised if the results of ray tracing optimization on a Maksutov system do not agree exactly with the difference in radii (R2 - R1) predicted by this equation. Generally, the optimal difference in radii is relatively insensitive to small changes in the value of the radii R2 or R1; these radii only change with changes in the effective focal ratio of the system. Although there is room for some error in the radii of the front and back surfaces of the corrector, the tolerance in the difference of these radii is much smaller and is the most difficult tolerance to be achieved in the fabrication of a Maksutov system. My starting design was that presented by Robert D. Sigler in the "Gleanings for ATM's" department of Sky and Telescope, September, 1975. In this design the secondary mirror is a separate optical element. This allows for greater freedom in correcting the system for aberrations across the approximately 2 degree wide field of view of this instrument. The original Maksutov-Cassegrain design of John Gregory employed an aluminized spot on the back surface of the strongly curved meniscus corrector lens as a secondary mirror. Although convenient, this design is limited to focal ratios above F15 unless an aspheric correction is applied to some element in the optical system. Commercial manufacturers often push this below F11, with F6 or lower not being uncommon in some spotting scopes or telephoto cameras. At the faster end, an additional field flattening lens is used to reduce the curvature of field inherent in these designs. My goal in modifying Sigler's design was to reduce the length of his instrument while maintaining the aberrations to a minimum. Computer ray tracing optimization was used to find the optimal system parameters while holding the lens to primary mirror distance CP fixed as well as the effective focal length (see the diagram below for the design geometry). Two programs were used to do this: some hard-wired ray tracing code of my own, and a ray-tracing demo package called KDP (aka RoadRunner, and now Enterprise). In the end, KDP was only used to verify the results produced by my own code out of fear that KDP was converging on local minimum solutions. BTW: I now prefer to use the demo version of SynopSys for my optical designs. My own optimization code was "stupid" but robust; I simply scanned all of parameter space until a best solution was found. In either case, the figure of merit used for the optimization was the RMS spot size across the field of view. The following table is a comparison of the root mean square (RMS) spot sizes computed for my design and Sigler's design scaled to a 7.5" instrument. The spot diagram computations traced 500 rays for each of the wavelengths: 435nm, 486nm, 587nm and 706nm. Comparison of root mean square spot sizes RSS ( in inches) for two 7.5" aperture F8 Maksutov-Cassegrain telescopes. Clicking the linked text will display the respective spot diagrams. 0.35o 0.00021" 0.00041" 0.00033" 0.37" from o.a. 0.70o 0.00059" 0.00097" 0.00097" 0.74" from o.a. The theoretical diameter of the Airy disk for a 7.5" instrument is 1.28 seconds of arc, which works out to 0.00038" in an F8 instrument. Thus the diffraction limit is attained in both designs for objects on axis, although there is some image degradation near the edge of the field. Sigler's design is clearly to be preferred in any case where the tube length is not an issue; in no case was I able to match the performance of his design while shortening the tube by more than 6" (and maintaining the F8 focal ratio). Readers of Sigler's article may notice some difference in the RMS spot sizes quoted here and those implied by the spot diagrams in his article. The spot sizes here assume a flat image plane while it appears that Sigler adjusted his focus position near the edge of the field to compensate for Petzval curvature (curvature of the image plane). This analysis is valid in a visual instrument where the eye can accommodate for the small difference in focus position between the center and edge of the field (at low power). In any case, "standard" photographic resolution across the field of view at the prime focus (~0.001") is easily achieved in both instruments, assuming a flat image plane. Nearly equivalent on-axis performance of my design was achieved against Sigler's when the front of the lens was slightly aspherized to a weak oblate spheroid with a conic constant of 0.0009 (fourth column of the above table). This however does nothing to improve the off axis performance which is limited largely by Petzval curvature. The greatest disadvantage of these instruments is the large central obstruction of the secondary mirror, which is inevitable in any fast Cassegrain with a reasonably flat image plane Introduction of a field flattening lens would allows for a more compact design, as is often done in commercial Maksutov's. The central obstruction has the effect of throwing light into the outer rings of the diffraction pattern, so that the theoretical diffraction limited resolution cannot be obtained (see  for a discussion of this). An F15 or slower Gregory Maksutov would undoubtedly be better suited for planetary observation in this respect. The dimensional specifications for my Maksutov are given in the table below. The tolerance on R1 and R2 is ±1%, but (R2 - R1) must not differ by more than 0.1%. The tolerance on the lens thickness, primary and secondary radii of curvature R3 and R4 are all ±2%. If significant deviation is made from the prescribed radii of curvature of the corrector then retracing may be used to re-optimize the system for the new values (as long as the difference between the radii on both sides of the corrector is maintained, the design won't suffer much). It is probably a good idea to do this, even if one hasn't strayed much in the specifications. For this reason, it is best to begin working on the corrector lens rather than on the primary or secondary mirrors. I also calculated diffraction point spread functions for on-axis imaging in my design (see diagram below). These calculations included effects due to the secondary mirror obstruction but should be interpreted with caution because the finite grid size used in the computation can introduce false periodicities in the point spread function (this can be seen for example in the point spread function plots with the focal plane 0.05" inside/outside the best focus). The important point to notice is that the point spread function is symmetric at equal distances inside and outside the focus. This contradicts certain claims that have been floating around that Maksutov systems mysteriously behave differently from other optical systems in that the diffraction disk is asymmetric on either side of the focus. If a difference is noted between the point spread functions at 0.006" inside and outside the focus this is due to the slight difference in the distances used (the lower diagram is actually slightly closer to the focus). The 8" diameter BK7 corrector blank was purchased from Newport Glass, it had a radius of curvature of 11.4" on the convex side and 9.9" on the concave side with an edge thickness of 1.0". It was a custom formed piece costing $160 U.S. (October 1997, F.O.B.) and took 6 weeks to prepare and ship. Newport now appears to stock 6.6" blanks as part of their standard selection. A three footed spherometer was constructed using the barrel of an inexpensive ($35 CDN) 1" travel micrometer - this worked out well in the end, with readings repeatable to ±0.0001" on the same side of the corrector. In hindsight, I would seriously consider spending the extra cash for a good micrometer and leave as little to chance as possible. Originally I had anticipated measuring the difference in curvature between the two sides of the corrector using an interchangeable set of feet on the spherometer. However, when I reached the finer grades of abrasive I found that the measurement repeatability was too poor to continue using this technique. Instead I opted for a direct spherometer measurement of the concave side of the lens and indirect measurement of the convex side by measuring the curvature of the tool. The danger with this method is that one must assume that the radius of curvature of the tool matches that of the lens - this is not always true, especially if strong curvature correcting strokes have been applied prior to measurement. In order to minimize this effect, each corrective grinding spell was eased off (in the last ~10 minutes) to short centred strokes. The spherometer was zeroed on a 3/4" thick by 8" diameter plate glass flat produced using the standard three disk flat generation method (See for example , p.189). This glass was fine ground down to 5µm grade abrasive but not polished. Centring of the lens was controlled using the wedge control device described at this link. Wedge was controlled to within ±0.0002" (actually, probably better than ±0.0001"). The grinding tools were made of 1" square by 3/16" thick building tiles. These are the kind of tiles that are made of hard ceramic and do not have a glazed finish (the substrate used on glazed tiles is too soft). A sheet of aluminum foil was placed over the lens, the tiles laid on top of the foil (with the backing paper side down) and polyester resin ("fiberglass resin") was poured over the tiles to hold the whole thing together. A wooden disk was cemented to the back of the tile/polyester-matrix tool to provide additional thickness. These tile tools were notorious for providing hiding places for abrasive (and subsequent scratching). Recently (July 1999) I've been using a tile/plaster-matrix to grind a 10" F1 mirror and have had less problems with scratching than using the polyester matrix tool (in this case I avoided using the 5µm grade altogether). All grinding and polishing work was done by hand. A grinding schedule should be worked out as soon as the coarsest abrasive grade is completed. It is surprising how much glass is lost during the #220 and #320 mesh abrasive grades, so don't underestimate the starting thickness of the glass if you order a custom made blank. Grinding the primary mirror to the required radius of curvature was a breeze once the corrector was done. The central hole in the primary mirror was a rather wide 2.2" in diameter so that the full (useful) 1.5"x1.5" photographic field of view would be acceptable. A thin 2" diameter brass tube was used to baffle out sky light. In generating the secondary mirror I first cut out a 5" diameter blank from 1/2" plate glass using a biscuit cutter and #80 carborundum. The secondary mirror blank was cut out from the centre of this blank in a similar fashion (using 3" aluminum irrigation pipe for the biscuit cutter) taking care not to fracture the outer ring of glass. The secondary blank was then plastered back into the centre of the 5" disk (as shown in the photograph below) with approximately 3/16" of the groove filled with polyester resin (on the business side of the blank). The resin served the dual purpose of preventing abrasive from getting caught in the plaster and especially to provide a smooth surface that would be contiguous with the glass surface during polishing (thus reducing the possibility of a turned edge). This worked quite nicely, without producing any scratches in either the grinding or polishing stages. Once polishing was complete, the surface produced (as tested by interference against the polished out 5" tool - Foucault null tested to a sphere) was automatically quite spherical, or at least, to within 1/10th of a wave or so. The edge of the mirror was wonderfully free of any hint of a turned-down/up edge, as would undoubtedly have been the case if the mirror hadn't been worked as the core of a larger disk The initial efforts spent in preparing the 5" cored blank paid off quite nicely by the relative ease of achieving the desired optical figure. A word of caution if you intend on using the above method of working the secondary: don't rush when you remove the polyester resin. The resin is best removed by pushing from the front once the plaster has been scraped out from the back; but only do this if the resin remaining is very thin. You will chip the edge of the mirror if you rush the job. It would be best to remove the resin by chemical means, or at least weaken it enough so that it may be removed easily with a bit of scraping. I suspect that acetone may be useful in doing this (given enough time), but I haven't tried it. Once the mirrors were aluminized the optics were tested by auto collimation using an oil flat. A very heavy gear oil (SAE 85W 140) was employed to damp out vibrations (vibration was definitely a problem when testing in my 3rd story apartment flat). The test appeared to indicate a system that was slightly under corrected (oblate). This was confirmed by a Foucault test on a star as well as by a diffraction ring (or star) test. The outer diffraction rings when a star was outside the focus were unduly bright compared to the outer diffraction rings as seen inside the focus. The diffraction pattern was observed with a 10 mm eyepiece and a 2X Barlow lens. I used a petal polisher on the concave surface of the lens for one hour before re-testing the system. This produced a very marked improvement in the image quality; my 10 mm 65o apparent field of view eyepiece gave very crisp images of the moon right out to the edge of the field of view. There was no noticeable chromatic aberration. I didn't bother with an oil flat test since my previous experience had shown that the test would not be sufficiently sensitive to determine what correction if any should be applied to the system. This was partly due to vibration and air currents, but was primarily due to the difficulty of collimating the scope in its inverse position and the poor contrast caused by the low reflectivity of the oil. A Foucault star test seemed to indicate a very slight amount of over correction as did a Ronchi star test using a 55µm grid (I used nylon sieve mesh as my grating; this was obtained many years ago from Small Parts Inc.). Over correction was also suggested by the asymmetry of the diffraction rings immediately inside and outside the focus, however the asymmetry now was not as marked as in the system prior to application of the petal lap. I therefore proceeded to polish the concave side of the corrector for an additional 20 minutes. The change this produced on the imaging now was not as drastic as before, however a noted improvement was observed in the brightness of the Airy disk relative to the outer rings. The Foucault and Ronchi tests on a star failed to show anything conclusive as to residual (on-axis) aberrations of the system. Another 30 minutes of polishing on the petal lap seemed to improve the diffraction disk, but this may very well also have been due to improved collimation of the optics. When testing on a 3rd magnitude star, only the first diffraction ring, a hint of the 3rd ring and the central Airy disk were visible. A very slight hint of distortion due to primary mirror flexure was also discernible but not serious. 1. With only the primary mirror installed and the collimator inserted in the focus tube, the laser beam is aligned with the optical (mechanical) axis of the telescope. A plexiglass disk with a precisely drilled central hole facilitates centering the laser beam with the OTA. 2. Center the baffle tube with the optical axis (now defined by the laser beam). 3. At this point the corrector lens is installed with the secondary mount removed so that the alignment beam can pass through the hole in the corrector. If a white card is held near the radius of curvature of the corrector (about 10" away in this case), one should be able to find a point where the image of the laser spot on the card formed by the front surface of the corrector lens, is focussed on the card. With antireflection coatings this image will be dim, but it IS visible. The goal is to adjust the tilt of the corrector lens until the image of the laser spot coincides with the laser spot itself. Obviously, you'll have to guess when you're close because the image of the laser spot won't be visible when it is near the laser spot itself (which is MUCH brighter). 4. Repeat the above procedure, but now looking for the image of the laser spot created by the primary mirror - the image of the spot in this case will be further away but much brighter than that formed by the corrector. I attach a white card to a metre stick taped to the side of the OTA so that I can easily observe the reflection of the laser spot while making adjustments to the primary mirror. 5. Insert the secondary mirror and align its centre with the optical axis. The easiest way to do this (if you can't get your head inside the OTA) is to use a circular white card with 1/4" black ring drawn in its center. In my case this card was cut to fit over the secondary mirror baffle so that it was centered with the secondary mirror. The position of the beam on the card can be inspected by looking for the reflection of the card in the primary mirror, looking through the front of the telescope. 6. Finally, adjust the tilt of the secondary mirror. The reflected alignment beam from the secondary mirror should return to the laser diode. A white perforated card placed inside the collimator where the laser beam emerges is convenient for observing the reflected beam from the secondary mirror. As was the case with step 3 (and step 4 to a lesser extent), you'll have to estimate when the returning beam is colinear with the emergent one. This collimation method consistently produces an alignment that stands up to the star test, as well as being well aligned with the OTA. Traditional coarse visual alignment followed by a star alignment, does not guarantee good results and certainly does not ensure that the optics and OTA are aligned. This alignment assumes that the focuser is aligned with the OTA. A commercial laser collimator (as used for aligning Newtonians) will quickly indicate whether this is the case. Otherwise, some means can be found to precisely align the laser beam in the homemade collimator with its mounting tube. However, this assumes careful machining of the collimator, which is definitely not the case for example shown here! The original coatings were bare aluminum deposited by myself, using high vacuum equipment in the department of physics at Simon Fraser University in Burnaby, British Columbia. These coatings, which held up surprisingly well for several years, were replaced in November of 2003 with enhanced aluminum coatings done at Sirius Optics of Kirkeland, WA. At the same time, the corrector lens was coated with MgF2 coatings and the tertiary mirror (diagonal) was replaced with a high reflectivity dielectric mirror (97% reflectivity in visible). These improvements resulted in an estimated 40% throughput improvement over the original configuration. I was fortunate enough to have access to a 12" lathe, 6" lathe and a milling machine so that most of the parts were machined from various aluminum and brass scrap yard findings. The goal was to produce a mounting that was both rigid and light enough for transportation. When most of the machine work had been completed, the scope was disassembled and (almost) every piece was milled to remove excess metal. The complete weight of the scope, counter-weight and tripod included, is somewhere around 100 lbs; not a light 7.5" of aperture by any means. The right ascension drive posed the greatest design problem since I wished to place the drive gear between the fork and the top R.A. shaft bearing. The advantage of this design is that it places the R.A. circle in an easy to read location and it may still be directly connected to the drive gear so that it need only be set once for each observing session. The downside to this configuration is that it increases the overhang of the fork over the top R.A. bearing and thus requires a large R.A. shaft to prevent vibration. Careful design allowed me to insert the 7" Byers gear with its friction clutch, the R.A. circle assembly and a clamp ring for manual slow-motion, while maintaining a distance of only 2.5" between the base of the fork and the top R.A. bearing. The top R.A. bearing is a cylindrical roller bearing with a 2" bore, 5" O.D. which set me back all of $1 at the junk yard. The lower R.A. bearing uses a ball bearing with a ~1.25" bore. This lower bearing supports all of the thrust directed along the R.A. axis, but this is not a problem at mid to high latitudes where most of the force on the bearings is applied perpendicularly to the R.A. axis. The following sequence of photographs show the R.A. axis block in various states of disassembly. The diameter of the large gold ring in the first and second photograph is 9". The photograph on the left shows the guts of the focussing mechanism; focussing is achieved by moving the primary mirror. The mirror rests in a nine point flotation cell (the retaining ring above the the central perforation contacts the mirror lightly). The flotation cell rests on an aluminum bronze sleeve that slides freely but with almost no play on a brass tube that is firmly threaded into the main backing plate (the large black disk). Movement of the sleeve along the tube is restricted to the axial direction by a slot (in the sleeve) in which a small set screw has been inserted (in the brass tube). The lower end of the aluminum bronze sleeve is threaded (at 10 tpi) so that the rotation of a mating "geared nut" controls the movement of the sleeve along the central brass tube. The geared nut was fabricated from a discarded 5" (automobile transmission?) spur gear into which a (10 tpi) threaded brass ring was pressed and glued. Axial motion of the gear is prevented by a spring loaded ball bearing that presses against the top of the gear (this is what the assembly with the bare aluminum block to the lower right of center in the photograph is all about; the bearing is hidden from view). The 5" spur gear is turned by a 1" pinion connected to a large 2.5" diameter focussing knob (the gold anodized piece at the bottom of the photograph). The whole sliding assembly is spring loaded by three light springs; this was found to be essential to allow easy movement in either focussing direction. The focussing is smooth although it requires substantially more force than one typically finds in commercial movements of this kind. This is primarily due to the weight of the mirror which was made from a near full thickness Pyrex blank. There is a certain amount of image shift when focussing which can be troublesome when using the most powerful eyepieces (6-10 mm) but this it is not noticeable with 18 mm or longer focal length eyepieces. In late 2003, the 2" adapter tube plate was replaced with an SCT style JMI motorized focusser, mainly to avoid problems with mirror shift when doing CCD work, but also to make the scope "friendlier" for inexperienced visitors to use. This was part of a general overhaul of the scope following the 2003 Mt. Kobau star party which included improving the mirror coatings and (up to then inexistent) lens coatings . At the same time, the baffle-tube mount was made adjustable so that it could be precisely aligned with the OTA. The secondary mirror was mounted using a system similar to that described by Texereau  with the difference that an additional set of adjustment screws were included near the mirror to allow for fine tip/tilt adjustment. One should note that the three externally accessible screws adjust both the mirror tilt and mirror centring in the tube; they are primarily intended for adjusting the centering of the mirror with the optical axis (not tip and tilt). The inside of the tube (made of a piece of 10" aluminum irrigation pipe) was lined with high quality 1/2" foam of the kind used as bedding for camping. This worked quite well since the foam was sufficiently rigid to hold itself in the tube when cut to a width somewhat larger than the internal circumference of the tube. The tube was baffled by four, thin painted Plexiglas rings and the foam was lined with black velvet cloth - the baffles are not so much for cutting light as to impede air flow along the tube. A small computer fan at the top end of the tube assists in cooling the scope before use. This fan draws air in (through a filter) near the top of the scope and exhausts through the eyepiece tube. Note that if this flow were reversed, dust would be drawn into the scope unless a filter were placed over the eyepiece tube. The setting circles were made by drawing up the tick lines in an (archaic) CAD program and importing the .DXF file to a drawing program where the tick labels could be more conveniently added. The setting circles were printed directly on overhead viewing material using a laser printer and glued to gold anodized aluminum disks. The contrast of the numbers on these settings circles is surprisingly good - in fact, they almost look good! I had been somewhat worried about reflective glare from the plastic, but this didn't turn out to be a problem: somewhat cheesy, but it works. The tripod was made from 2" stainless steel pipe. Three folding tension bars connect the bottom of the tripod legs to prevent splaying (not visible in photograph below). Tension is maintained by tightening the gold anodized disk shown in the bottom center of the photograph above. The angle of the R.A. axis is adjusted using a 1/2" brass screw (right of center). Once polar alignment is achieved a pair of 3/8" cap screws clamp the wedge into position (i.e. the weight of the telescope does not normally rest on the brass polar adjustment screw). The optics for the finder scope were scavenged from an old pair of binoculars. The finder was purposefully made heavy to act as a counterweight for the counterweight mounted on the opposite side of the tube (seen to the left in the above photo). The finder is mounted on the tube using a sliding dovetail arrangement so that the finder may be easily removed for transport while maintaining good alignment with the main scope. The counterweight may be adjusted in two directions; by sliding along a dovetail groove mounted on the tube, or by rotating the counterweight disks about an eccentric pivot. The large thumbscrew seen in the photo (left) clamps the counterweight disks onto the pivoting block. The declination axis fine motion (right photo) is set up for both manual and motorized use. A clutch knob (hidden in photograph) engages a gear connected to a 20VDC, ~1RPM motor to provide the motorized fine motion. Cox, Robert E., "Maksutov telescope Notes", Sky and Telescope, July 1957. -Mostly out of date information about the acquisition of material suitable for corrector blanks. Dittmer, Herman R., "Northwesterner and His Astrophotography Equipment", Sky and Telescope, June 1975, 399-405. Field, Ralph W., "Maksutovs with Subaperture Correctors", Sky and Telescope, August 1981, 166-168. -A way to save a lot of glass! Gregory, John, "A Cassegrainian-Maksutov Telescope Design for the Amateur", Sky and Telescope, March 1957. -About the classic Maksutov-Cassegrain design, where the corrector glass also serves as the secondary mirror. Louth, Howard, "Notes on Constructing a 5-1/2 Inch Cassegrainian-Maksutov", Sky and Telescope, July 1966, 40-43. Louth, Howard, "A Large Maksutov with Newtonian and Cassegrain Foci", Sky and Telescope, February 1977, 139-143. Maksutov, D.D, Journal of the Optical Society of America, 34(5), 270-284.
aberration in an optical system. Phillips, Frank W., "Aspherizing and Other Problems in Making Maksutov Telescopes", Sky and Telescope, February 1963, 110-112. Sigler, Robert D., "A High Performance Maksutov Telescope", Sky and Telescope, September 1975, 190-192. -A design that uses a separate optical element for the secondary mirror to achieve a faster yet well corrected telescope. Tuthill, Roger W., "A Maksutov 11-Inch of Newtonian Form", Sky and Telescope, March 1964, 180-185. -Some of useful information, especially the grinding rates to be expected when grinding the corrector lens. Wright, Franklin B., "The Maksutov Lens Applied to Herschelian and Newtonian Telescopes", in Volume 3 of "Amateur Telescope Making", Albert G. Ingalls Ed., Willmann Bell, Inc., Richmond Virginia, ISBN 0-943396-50-6. Mackintosh, Allan, "Advanced Telescope Making Techniques", Willmann-Bell, Richmond Virginia. ISBN 0-943396-11-5 (Volume 1) , ISBN 0-943396-11-3 (Volume 2) . -Compilation of some of the better "Maksutov Circular" articles. Much practical information concerning fabrication of the corrector lens. Willey, Ronald R., "Cassegrain-type Telescopes", Sky and Telescope, April 1962. - Comparison of various Cassegrain designs using computer ray-traced spot diagrams. Texereau, Jean, "Advantages and Disadvantages of the Classic Cassegrain" in "How to Build a Telescope", Willmann-Bell, Inc., Richmond, Virginia, 2nd Edition, ISBN 0-943396-04-2. Planetary observers should read this article before thinking of constructing a fast (faster than F13) Cassegrain. Rutten, H. G. J. and van Venrooij, M. A. M., "Telescope Optics: a comprehensive manual for amateur astronomers", Willmann-Bell, Inc., Richmond, Virginia. ISBN 0-943396-18-2. - Probably the best all-round reference comparing the advantages and drawbacks of the more common (and less common) telescope designs employed by amateurs. In addition there are several archived discussions concerning Maksutov-Cassegrain design that can be found in the ATM archives. 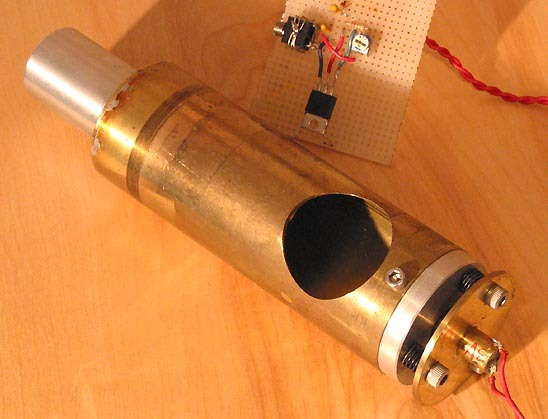 The Pyxis CCD Camera Project, A dual camera controller for guided astronomical image capture. Questions or comments? Address them to Marc René Baril: marcrene@hawaiiantel.net. For more contact info visit my home page. This page was last updated on February 16, 2004.